Bhubaneswar:5/11/18: After the farmers intensified protests demanding price, prestige and pension in Odisha, the State government today constituted an inter-ministerial committee to look into their demands. The committee headed by Finance Minister Sashi Bhusan Behera will prepare terms of reference to discuss the demands raised by the farmers. The three-member inter-ministerial panel is also comprised of Agriculture & Panchayatiraj Minister Pradeep Moharathy and Cooperative Minister Surjya Narayan Patro as the members. An inter-ministerial committee under the chairmanship of Finance Minister has been constituted today to consider interests of farmers and look into their demands, said Minister Sashi Bhusan Behera. Meanwhile, the farmers advancing towards the State capital on the NH 16 to attend a mega convention at Lower PMG clashed with the security personnel at Tamando on outskirts of Bhubaneswar today. 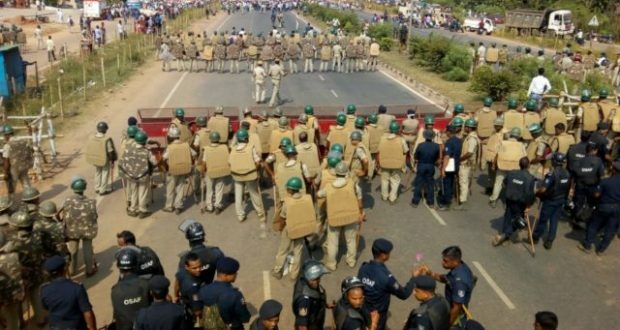 Despite Sec 144 clamped at Tamando, hundreds of farmers broke the police cordon to enter to Bhubaneswar for the event. Several protestors were taken into preventive custody following farmers-police face-off. On the other hand, the farmers approaching Bhubaneswar were restricted for entry at Hansapal area on outskirts of the city. Notably, the farmers moved towards Bhubaneswar on a call by the farmers’ wing Naba Nirman Krushak Sangathan to attend a mega convention at Lower PMG scheduled today to put pressure on the government to meet their demands.